See the Digital Marketing Information/Media Kit here. - easy-to-use control panel for updating your offer/info with login/password. - introductory mention highlighting your business to email subscribers in the Austin market area. - the return on investment for your marketing dollar grows as our network continues to grow, for the life of your business. - we promote each new business member to 1,000's via social media post/updates/tweets and +1's (on Google+, Facebook and Twitter). B. Premium Logo Rotation: logo branding in left column â€“ top-tier rotation. C.	Right Column Ads: (for food/fun promotions) text ad rotation in right column. 3. Your logo/pic/image as well as contact info, website address, email, etc. 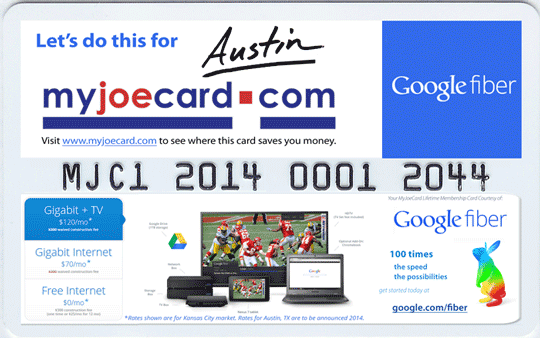 See the Google Fiber - branded MyJoeCard above and more examples here. B. Make It Your Network: When you order the logo-branded cards - it is like we have built the entire network JUST FOR YOUR BUSINESS. C.	Best Marketing ROI - Period: Know anything else more usable, relevant and valuable that has a longer shelf life? We canâ€™t think of one either. How many cards would you like? A. Standard Email Ads: your logo (linked), business name (linked) phone #/location and small blurb about your company + your promotion. We put you in the email blasts (currently twice monthly) keeping our 40K+ email subscribers up to date on latest news. Valuable, repeated, consistent branding build your business name and brand. B. Premium Email Ads: as above, but we create a larger ad for you leveraging graphic content (logo/pics) with professional copy writing to cast a wider net. C.	New Member Announcement / Blog Write-Up: with this one, it is all about your company. First we do an in-depth write-up about your company and post it at our blog site with cross-linking and multiple links to your website. Then we craft a New Member Announcement for an email blast that is about your business â€“ without other businesses. D.	Digital Asset Creation: Posting of email announcements (last 12 months) under Latest News page provides quality links, see here. We put them in this section for proper indexing by major search engines. The reposted email announcements are SEOâ€™d for building link strength impact. *Subscribers for our original market (Kansas City). Numbers for new markets will be related periodically as we grow. A. We build great websites: Check â€˜em out and ask our clients: midamericaradon.com, etterchiropractic.com, h2m2.com. Digital Strategy to drive the call or sale, with a custom-coded site architecture built with the future in mind (I.e. Microdata, Google Authorship, Proper Digital Assets, Page Load Speeds, et al.). B. And great mobile sites: Check â€˜em out and ask our clients: midamericaradon.mobi, etterchiropractic.mobi (as above). C.	Copywriting - we write great industry-specific copy for your site: This is where the rubber meets the road â€“ great original, industry specific copy for your website â€“ hand-crafted with the ideal combination of readability, reading-level, flow and importance delivered with a world-class knack for search engine optimization. D.	We can update/optimize your current website: If you are not ready to update your site, we can craft a digital strategy to maximize your current digital assets. E.	We can create and optimize your brand at all social media: Google Plus business pages, Facebook business pages, Twitter profiles, Pinterest and LinkedIn business pages. 2011 Award-Winner, Recipient of the 'Award of Merit'. State of Kansas and the Kansas Dept. of Commerce. 2010 Award-Winner, Recipient of the 'Award of Merit'. 2009 Award-Winner, Recipient of the 'Award of Merit'. 2007 Award for 'Excellence In Service'. 2005 award for 'Excellence In Service'. Visit our Media Relations Page here. We will arrange to meet with you in person or by phone to discuss your advertising needs, promotional strategy, draft for your profile (web presence at MyJoeCard.Com), current website, Internet traffic analysis & needs. We look forward to helping you increase you profits and marketshare! Send an Email to sales@myjoecard.com. Make a Payment by clicking here.